Make outdoor patios the center of attention with the elegant stylings of a premium Richmond Collection multi-pedestal table. Engineered with top choice commercial grade materials, these environmentally friendly multi-pedestal tables provide a bold sophisticated statement. The innovative design of these tables with detached benches creates a distinct look that features recycled plastic planks and oval-shaped steel tube end-caps. The open	access arrangement affords ample space to seamlessly move in and around the table top and bench seats. Available in configurations for both surface and in-ground installations, the frames are made with ultra-resilient 12-gauge, 2-3/8"O.D. powder-coated steel tube. 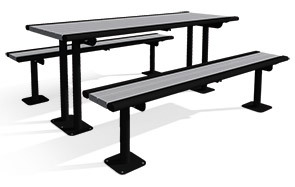 As a part of a Premium Collection, matching park benches, trash receptacles and picnic tables are available to complete a comprehensive, cohesive aesthetic.